NEW YORK, NY (December 14, 2017) – As a more expansive definition of beauty enters the mainstream, consumers are rewarding brands that get it right, while quickly retreating from those that miss the mark. Engagement Labs’ latest analysis of consumer conversations related to beauty and personal care brands illustrates this shift. 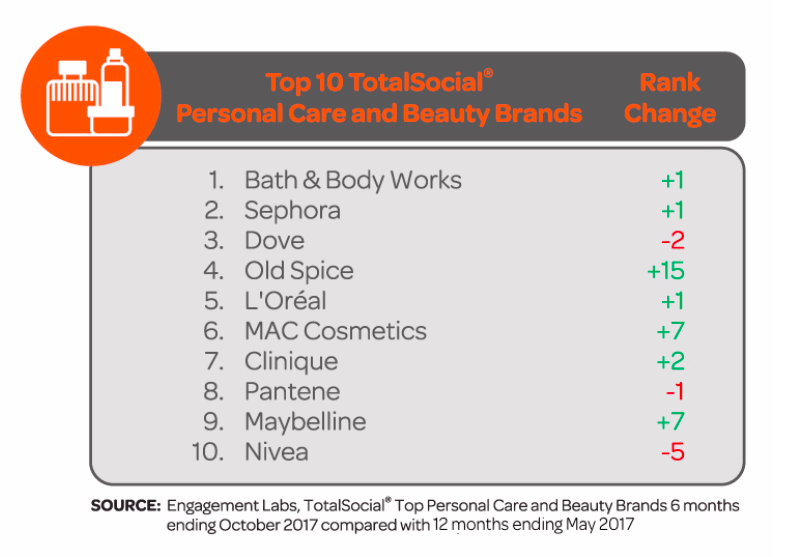 To help personal care and beauty brand marketers better understand what consumers are talking about with family, friends and peers, both offline (face-to-face) and online (social media), Engagement Labs released its latest TotalSocial® rankings of social influence among personal care and beauty brands in the U.S. The analysis looks at how each personal care and beauty brand has performed in consumer conversations over the last six months, compared to the Company’s previous ranking in May 2017. According to Engagement Labs’ report, Dove lost its number one spot after consumers criticized two of its marketing campaigns as insensitive. Meanwhile, Maybelline’s hiring of its first male brand ambassador helped lift it into the top 10. The ranking, which is unique in that it combines offline and online consumer conversations, is based on Engagement Labs’ proprietary TotalSocial data and analytics, which continuously measures the most important drivers of brand performance in both face-to-face and social media conversations. The brands in the top 10 have earned the highest TotalSocial scores in the category for the last six months. Previous frontrunner Dove fell two spots to third as the brand’s online sentiment and influence scores fell significantly. These dips can be attributed to recent campaigns that drew criticism. For example, in May, its “Real Beauty Bottles” limited edition packaging received negative reviews. More recently, the Company admitted it “missed the mark” with a Facebook ad that many viewed as having racist undertones. However, the brand still has the highest TotalSocial offline score in the industry, indicating that while these campaigns may be setbacks, they haven’t permanently damaged the brand’s reputation. In contrast, Maybelline cracked the top 10 with improved online sentiment, which indicates that consumers are speaking positively about the brand on social media. It also saw its offline brand sharing rise, an indication that consumers are talking about the brand’s marketing. These scores improved after the brand announced it was recruiting two makeup artist vloggers with large social media followings to promote their new mascara line. In fact, vlogger Manny Gutierrez is the brand’s first-ever male brand ambassador. Like CoverGirl, which added 17-year-old makeup artist James Charles last October, Maybelline is embracing the expanding definition of masculinity and a focus on Millennial Men, who are highly influential in this market, as Engagement Labs’ noted in a recent study. Old Spice jumped 15 spots to number four due to a big gain in online influence, which indicates the success the brand is having in connecting with the day-to-day influencers. Its offline sentiment also rose significantly. The Company’s recent “Stay Unforsweatable” campaign, featuring Denver Broncos linebacker Von Miller, is more subtle than previous efforts, but the creative and slightly wacky tone of the ads is garnering attention for the brand among online influencers and in offline conversations. Big improvements in online sentiment and offline brand sharing were behind MAC Cosmetics’ top 10 breakthrough. By the end of 2017, the company will have launched 50 new products in collaboration with three well-known make-up artists. These collaborations generated social media conversations and created a lot of excitement around the brand. The company also announced a special collection, developed in response to a fan petition, honoring late R&B singer Aaliyah. Engagement Labs (TSXV:EL) is the world’s first TotalSocial® company, offering intelligent data, analytics and insights for marketers. We are leaders in tracking, measuring and benchmarking the impact of conversations happening around a brand and industry – both online and offline. Consumer conversations are a proven driver of critical business outcomes, including sales. The patent pending TotalSocial data solution provides brands with unique insights and powerful analytics to understand online and offline social impact and drive business results. TotalSocial demonstrates to marketers how their online and offline conversation compare and contrast and helps identify areas of competitive opportunity or significant emerging threats. TotalSocial is an “always-on” proprietary scoring system, based on the most important drivers of brand performance: Volume, Sentiment, Brand Sharing and Influence. TotalSocial was built on the pillars of Engagement Labs’ patented social media measurement tool and the world’s only offline word of mouth tracking system for brands and tracks 500 brands across 16 major industry categories within the U.S., and 350 brands across 18 industry categories in the UK.